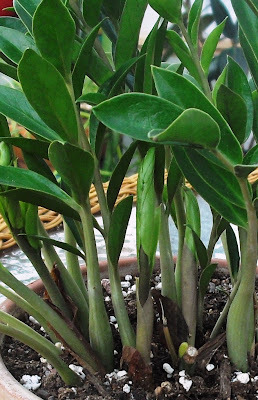 Life Among the Leaves: Unidentified Zamioculcas-Like Object--What Have I Got Here? 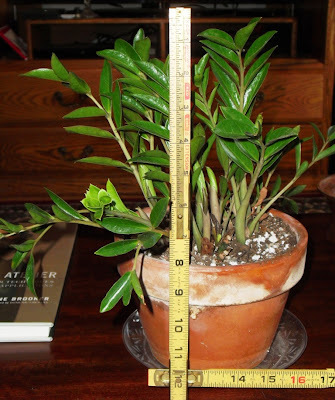 Unidentified Zamioculcas-Like Object--What Have I Got Here? 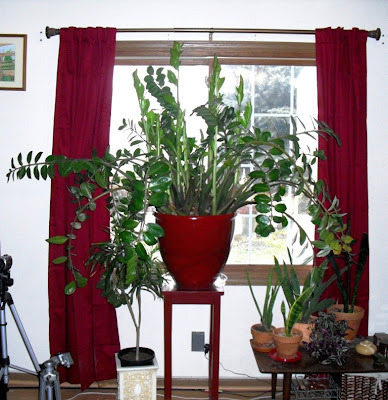 I have long been a fan of Zamioculcas zamiifolia, aka the ZZ plant. I've written about my large plant before. I've had it since 2001, and it is still going strong. producing 12 new leaf stalks. Then, last summer I purchased a new plant, at either Home Depot or Lowe's. (I don't remember which.) It looks very much like a miniature ZZ. However, upon doing some web-searching, I have been unable to identify this plant. This surprises me, because neither of the above places are known as a source of horticultural oddities. Unidentified Zamioculcas-like Object, hereafter known as UZLO. that of the species ZZ. UZLO with ruler, to show size. to show size. Thanks, Bob! Searching for dwarf or miniature Zamioculcas, one gets hits for "Zamicro," which has thinner stalks and less succulent leaflets, but isn't smaller in growth habit. The leaflets are just as large as those of the usual ZZ, and it seems to have the potential to grow just as tall, so I've concluded that my plant isn't one of those. UZLO is petite, and the leaves are proportional. 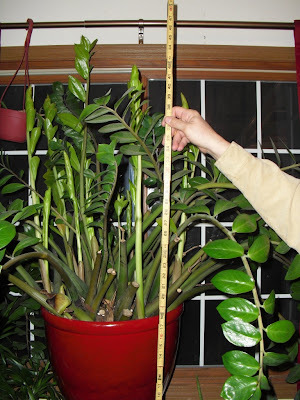 I considered that maybe I just have a juvenile ZZ, but I have seen pictures of new plants started from standard Zamioculcas leaflets, and the new growth, which has leaflets smaller than those of their parent plants at first, still seems generally larger than those of UZLO. I could be wrong about that, though. So, I'm putting it out there, in hopes that someone knows what I have. If not, I rather like the name UZLO. Is it an Oleander? Looks like a bush I had in my backyard in Southern California. No. I've since seen some with tags, and according to Exotic Angel anyway, it is a Zamicro. 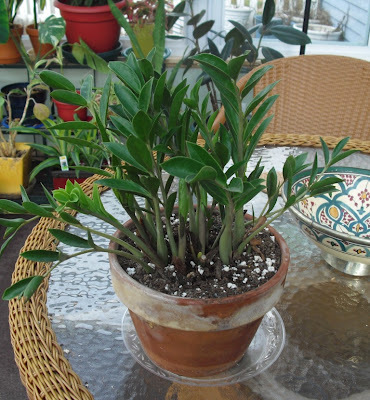 I have same exact plant, and also would like I have for care purpose, but I guess I will treat it as a zz plant uzlo as well.